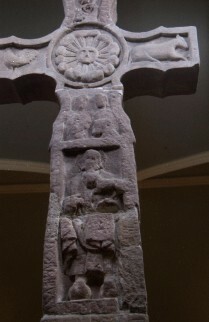 Back of the Cross: on the top arm of the Cross there is a bird perched on a vine. On the bottom arm there are two figures, the one on the right is holding a book. At the top of the shaft John the Baptist is standing on two globes and holding the Agnus Dei in his left hand. Inscription reads: '+[A]DORAMUS'.